Visiting or Live in Orange County? Come out to our beginner and intermediate Rueda class at 7pm, every Monday night in Costa Mesa! We break down the footwork and the steps and learn lots of new and exciting moves! On Sunday, February 23, 2014, we have a surprise treat for Cuban salsa dancers far and wide. 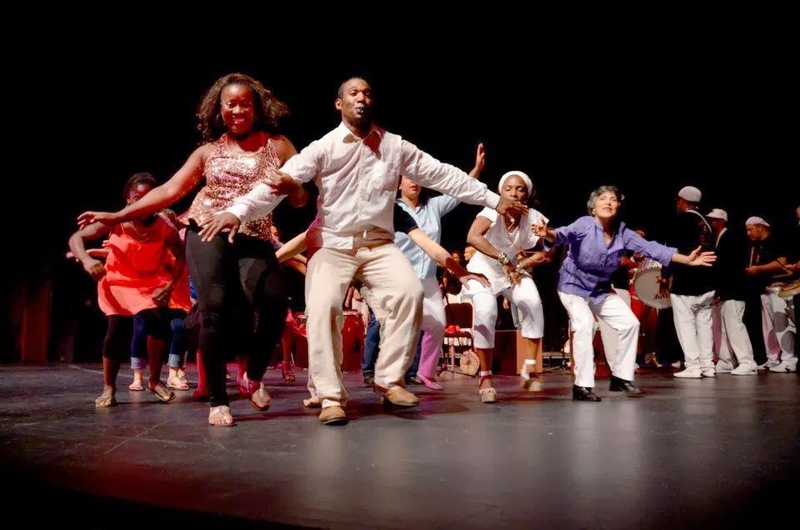 Julian Mejia, Director and CEO of SalsAtlanta, a well-known Cuban Salsa dance instructor at the San Francisco Salsa Rueda Festival, who hosts the annual SalsAtlanta 3-Day Cuban Party, will be in San Diego to teach Cuban Salsa dance workshops. This is intended for a smaller group as we only have a smaller room for this. If you are a beginner, please DO NOT sign up for this workshop. ALL LEVELS WELCOMED. Cleaning up technique for social dancing and the rueda dancing. ALL LEVELS WELCOMED. Who is really leading and who is really following in the social dancing and the rueda. Please Pre-register for the workshops by contacting Maritza Baida at sbdiva32@yahoo.com. Please e-mail me your name, what workshops (Workshops #1, #2 or #3) you plan to sign up for and how you will pay. Julián Mejía, started to dance salsa at the age of 17. His interest in Cuban music started at age 9 and since then, Cuban, Classical and classic Rock have been his passion. Julián moved to Miami in 1995 and soon after started learning Casino with Ramani Nicola (Salsa-Casino Dance Studios) and Henry Herrera (Verdaderos Reyes de la Salsa Dance Studios). During his time in Miami, Julian traveled to Cuba as he was interested in learning more about the culture and the music of the island. 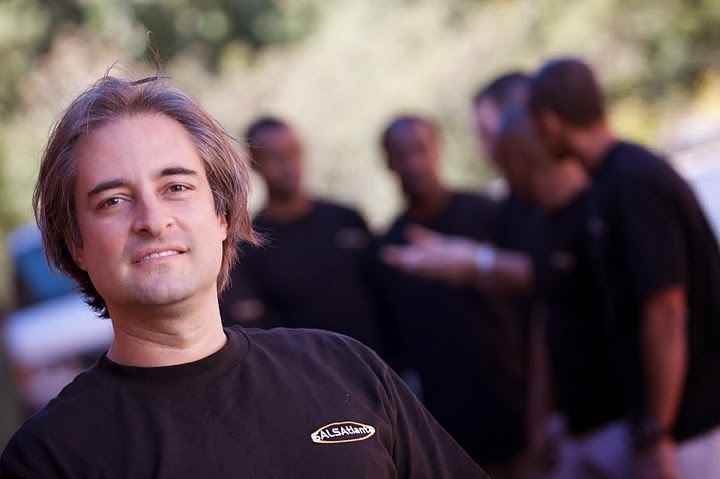 In 1999, Julián moved to Atlanta and under the name of SALSAtlanta, started the only Casino school and Casino performance group in Georgia. More than 6,000 students have passed through his classes in Atlanta and Athens, Georgia. Julián also conducts salsa classes in different clubs in the greater Atlanta area. Julián has contributed to spreading the Casino style in Atlanta and beyond by conducting workshops in different cities around North and South America. In 2007 was recognized during the 6th Annual International Salsa Congress in Miami by the school Salsa Lovers with the "Alex Award" for his contribution to the world of Latin Dance. He also helps spread the salsa with his website, SalsaCasino.com, and is co-founder of SalsaPower.com, SalsaSpaces.com and webmaster of LatinCoolNOW.com. Our next class will be on Saturday, February 22nd. Beginner level starts at 11:30am and Intermediate level starts at 12:30pm. Suggested donation of $5/person. Spread the word, be sure to tell a friend or two and invite them to join the fun. We will see you there. Una Bulla !!! SAVE THE DATE! On Sunday, February 23, 2014 (time and location to be announced), we have a surprise treat for casineros far and wide. Julian Mejia, director of SalsAtlanta, a well-known casino instructor at the San Francisco Rueda Festival, who hosts the annual SalsAtlanta 3-Day Cuban Party, will be in San Diego for business and has graciaously offered to do casino/rueda workshops at the end of February. When we hosted him back in Seattle, workshops were filled and I almost had to turn away people because we hit capaicity of the studio. Once I mentioned his name, people from Vancouer BC, Victoria BC, Corvallis Oregon's Rumbanana folks, Estern and Western WA's casineros signed up. If you are wondering what makes him that good, its because his forte is teaching technique for dancing casino one-on-one and in the rueda. On his last day in San Diego, we are inviting him to the Club M at the Hotel Grand Del Mar to enjoy the live son music of Combo Libertad. Don't miss this chance to meet Julian and to learn from him on Sunday Feb 23rd and meet him at Club M on Thursday, Feb 27th. More details to come. If you are wondering what makes him that good, its because his forte is teaching to clean up technique for dancing casino one-on-one and in the rueda. He is the master of the "killer bee alarde" moves and making it looks so effortless. If you are curious, take a look at this video, one of my favorites of him just dancing socially at a party. His students know how to do this!!! Emilio Camacho, the organizer of this event is an amazing tumbador (really lovely person) and this is his first event. So for those who are not able to go to the San Francisco Rueda Festival, I highly recommend that you support Emilio's event. 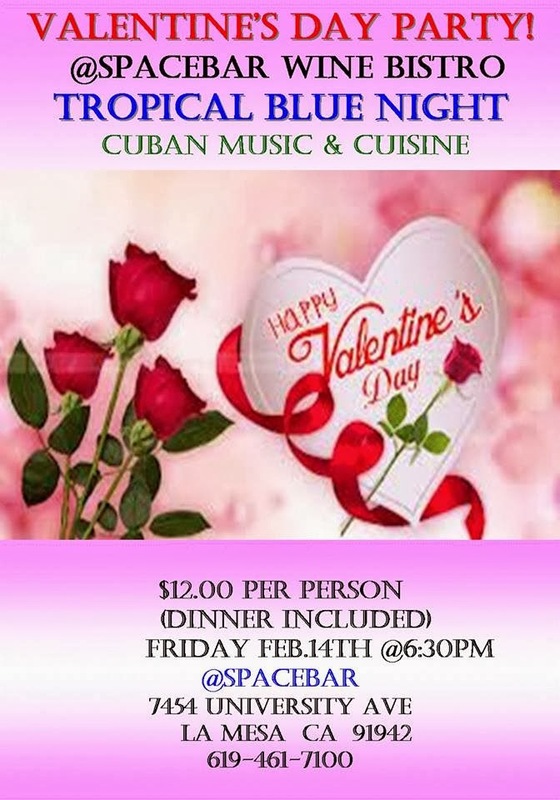 Cuban Music and Cuban Cuisine!! Below are the details. Weeaaaaa! This event is only available for those guest making advance ticket purchases. In L.A.: CELEBRATING LOVE & FRIENDSHIP @ CURUYE's CUBAN SALSA TIMBA DANCE PARTY! 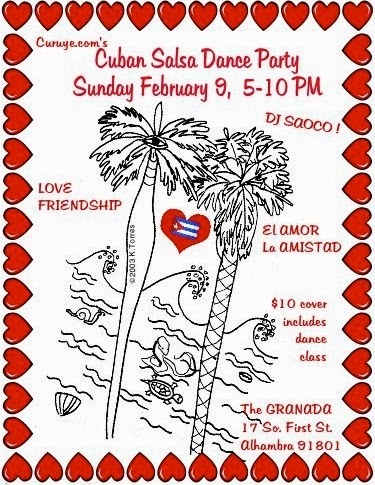 SUNDAY, FEBRUARY 9, 5:00-10:00 PM: CURUYE's CUBAN SALSA TIMBA DANCE PARTY! TIME TO CELEBRATE LOVE & FRIENDSHIP! IT’s CURUYE’s VALENTINE’s CUBAN SALSA TIMBA DANCE PARTY! SO BRING YOUR FRIENDS & LOVED ONES , and LET's DANCE! DJ SAOCO will be at the helm spinning CUBAN SALSA, SON, TIMBA & REGGAETÓN! LARRY THOMAS is back by popular demand BREAKIN’ DOWN THOSE FUNKY CUBATÓN MOVES at 5:30 PM! KATI HERNÁNDEZ’s PA’ LA ORILLA DANCERS will be leading some line dances, and you’ll dancing SALSA, CASINO, SON, RUEDA de CASINO, CUBATÓN! For this special occasion, you might want to partake of one of The GRANADA’s tasty meals. They have a varied menu of goodies to try out. There are discounts on our favorite beverages, and we have our own food service on the third floor. BRING YOUR FRIENDS & LOVED ONES TO DANCE AWAY THE EVENING! The GRANADA, (3rd Floor) 17 So. First St., Alhambra 91801. Free parking in parking structure across the street! $10 cover includes Larry’s dance class!